Skills formation is one of the main pillars of the European strategy for economic growth, EU2020. However, skills per se are not a source of growth; abundant and better skills can help the EU recovery and sustain growth only if they are put to work. Skills are embodied in people. They manifest into productivity and innovation when they are deployed by workers in the execution of tasks. It follows that reaping the benefits of states’, businesses’ and individuals’ investment in skills can only be realised when people are in jobs that make good use of their skills; when this happens, skills can be the root of economic growth. Put differently, if skills are a necessary condition for growth, they are not sufficient by themselves. The next step is to create and design jobs that make the most of workers’ skills. Organisations have a tremendously important role to play when it comes to skills utilisation because they command the way in which tasks are grouped together into jobs and define the autonomy or discretion workers have in their execution. Tasks have varying degrees of difficulty and may put varying degrees of strain on workers’ skills. Complex jobs (jobs consisting of complex tasks) put high demand on workers’ skills for a variety of reasons: because of the number of decisions to be made (problem solving), because of the uncertainty surrounding the expected outcomes from choices, because of the number of alternative courses of action, because of the large amount of information needed to be processed to reach satisfactory outcomes in complex situations and because of the need to use and integrate information from many different sources. The list goes on. Jobs requiring workers to perform complex operations, to find solutions to problems, and which confront them with unusual/unfamiliar situations need to be staffed by highly skilled individuals. This is not the end of the story, however, given that workers may experience varying degrees of skill utilisation during their working life. Matched workers are close to having the skills needed to perform in their job and workers perceive that their skills are adequate to ensure successful task completion. If workers have more skills than those required by their jobs, their skills are under-utilised. But workers’ skills can also be below the level demanded by their job. However, these situations are not fixed in time. The ESJ survey clearly shows that workers move between the various states. Table 1 details that most workers entering organisations in jobs in which they are underskilled achieve a better match between their jobs and skills (64%) over time or can even become overskilled (20.8%). Only 15.3% of those initially underskilled remained so [iv]. NB: Self-reported skills utilisation at two points in time: when hired (Beginning) and at the time of the survey (Current). Transitions between states are a result of the relative speed at which jobs become more or less difficult and complex and the speed at which workers’ skills develop – through learning and training – or depreciate through the process of skills obsolescence. For workers who joined organisations in jobs for which they were underskilled and currently report that their skills match job requirements, skills formation must have outstripped the increase in job requirements (alternatively jobs requirements may have decreased and skills could have remained stable). Change is characteristic of the experience of matched workers too; about eight in 10 EU workers in the survey who started in a matched position and remained in such a state over time experienced both an improvement in their skills and an increase in the complexity/difficulty of their jobs. So, to remain in a prolonged matched situation requires that skills develop in conjunction with changes in job requirements. Complex jobs may very well put strain on workers’ skills but, at the same time, they provide learning opportunities. Complex jobs confront incumbent workers with difficult choices and hard-to-solve problems nudging them out of their professional comfort zone and, by so doing, induce learning and skills development. 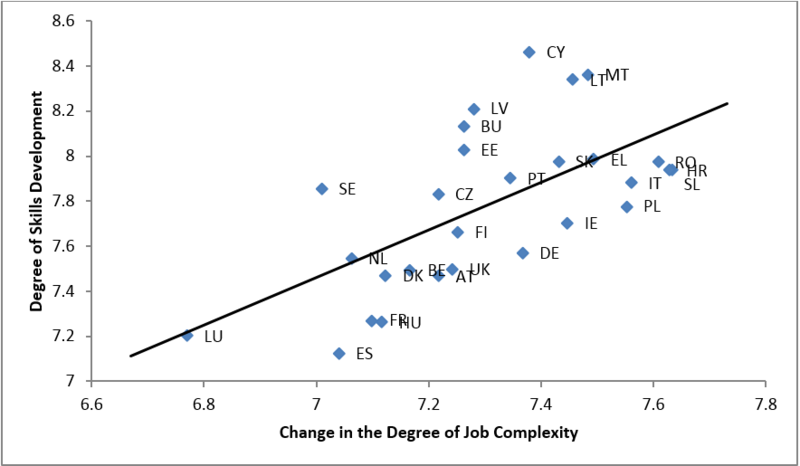 In fact, Figure 1 shows the relationship between changes in job requirements and the degree of skills development across countries. It is clear that countries in which the skill intensity of jobs has increased the most are also those in which workers reported the largest degree of skills development. This relationship is stable, it is also valid at the micro level. For example, more complex jobs are found to be associated with stronger skills developments in jobs within each occupation (1 digit ISCO). NB: Both scales measured on a 0 to 10 scale whereby 0 denotes 'decreased a lot' and 10 denotes 'increased a lot'. The ESJ data also corroborates that skills underutilisation is detrimental to skills development. For instance, Table 1 shows that about 80% of those joining their organisations in jobs for which they were overskilled, have not succeeded in making the transition to a situation in which their skills are used to a fuller extent. The ESJ data also shows that individuals that started their jobs as overskilled also have a lower degree of skills development. 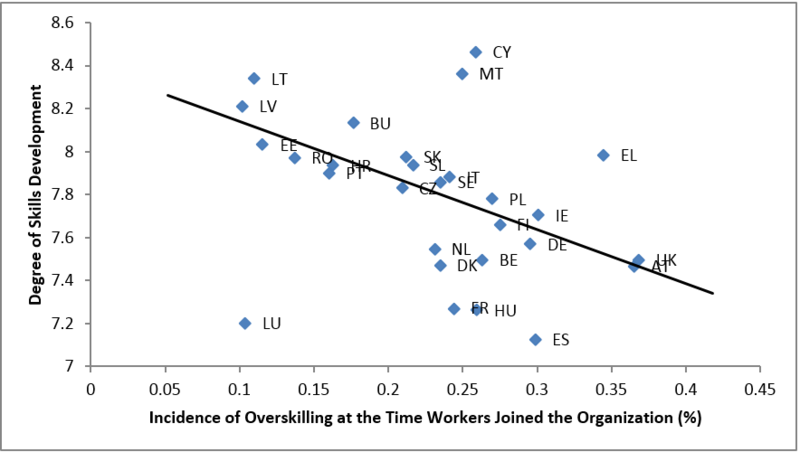 Figure 2 clearly shows this relationship at the county level: on average, a high incidence of skills underutilisation (overskilling) tends to be accompanied by a low degree of skills development among employees. Naturally, organisations have a crucial role to play in this process and they have an interest in maintaining the balance between changing job requirements and worker skills. Providing training – perhaps in cooperation with training providers – and supporting on-the-job learning are effective means that organisations can use to ensure the desired balance when jobs become increasingly complex. Changes in the degree of job complexity/difficulty are intrinsically linked to organisations’ operations: the introduction of new products, the adoption of new production processes and of new technologies, as well as organisational changes. Being able to make full use of workers’ skills impinges on organisations’ ability to compete successfully in product markets and to contribute to their innovation potential. Therefore, supporting organisations to design jobs that increase skills utilisation and formation is linked to creation of added value and competitiveness and should be at the core of EU polices aimed at promoting economic growth through investment in skills. NB: Skills development is measured on a 0 to 10 scale whereby 0 denotes 'decreased a lot' and 10 denotes 'increased a lot'. Source: European skills and jobs (ESJ) survey. Cedefop (2015a). Skill shortages and gaps in European enterprises: Striking a balance between VET and the labour market. Cedefop reference series, No. 102. http://dx.doi.org/10.2801/042499. [iv] This is an overly positive picture as the workers whose match did not improve from underskilling have probably left the organization and have not been able to answer the question (which was asked retrospectively).